I took a break today and visited one of my favorite thrift stores. 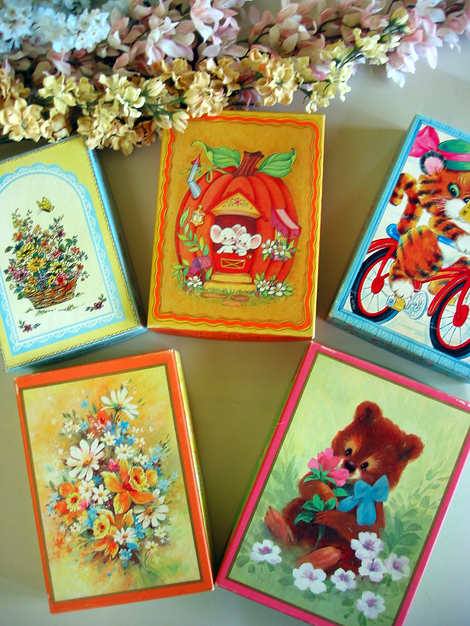 I found four boxes of vintage greeting cards "from the Coronation Collection." Have you see these boxed cards? 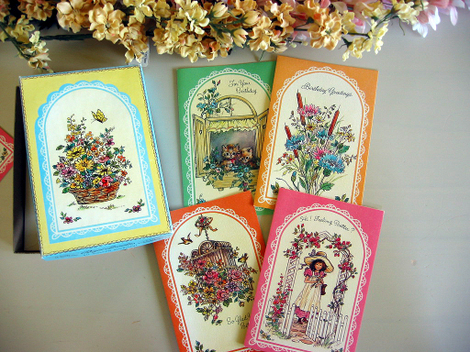 My grandmother used to get these at Woolworths, GC Murphys, or K-Mart. 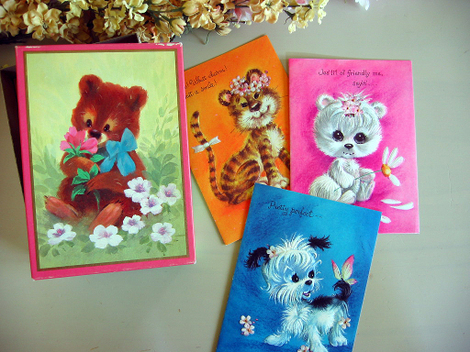 The cards usually had art work in soft colors with wide-eyed animals, sweet girls, and lush painterly flowers. They are always very sweet and saccharine cute. I love them and now have a collection. I'll use the cards but keep the boxes. 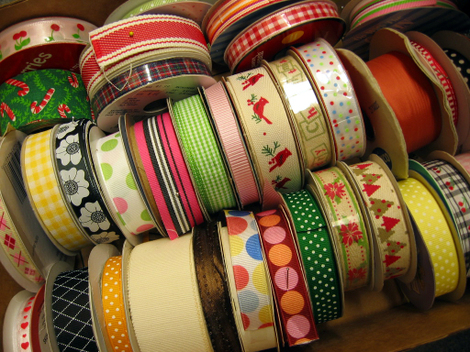 They are very nice and perfect for storing all sorts of little things. Can you say just "too stinkin' cute?" Look at these wide-eyed sweeties. These artworks remind me of the fun vintage/kitschy images collected by the Charles Anderson Design Company and found in their Pop Ink publications and products. I have two of their books with the coolest titles around: Happy Kitty Bunny Pony and Fluffy Humpy Poopy Puppy. 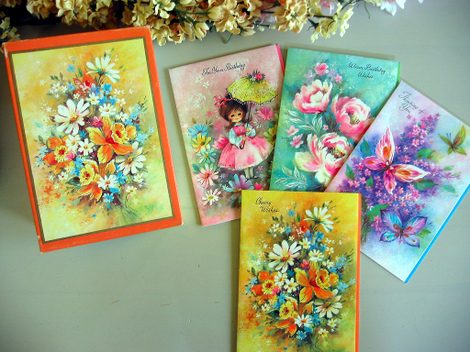 Now, these floral (and the little girl) images are just as too sweet and pretty. The pastel color combinations are so lovely. These two sets of cards (above and below) are little more current in their design approach. Probably from the 1980's. But they are still cute! This tiger box has its orginal K-Mart sticker which I don't want to remove. I don't have the cards in this box--used them up. 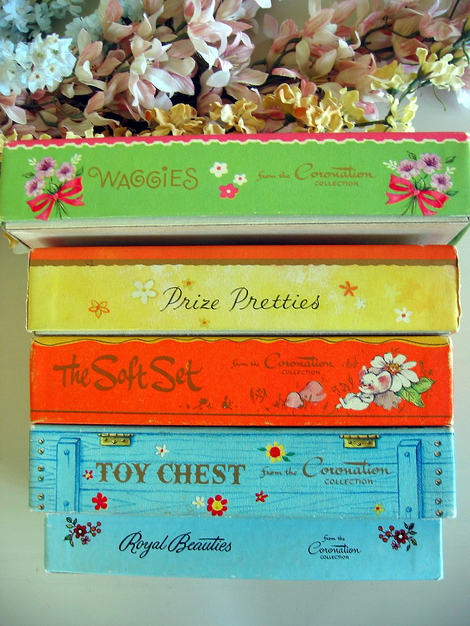 It was the first one in my Coronation Cards box collection. 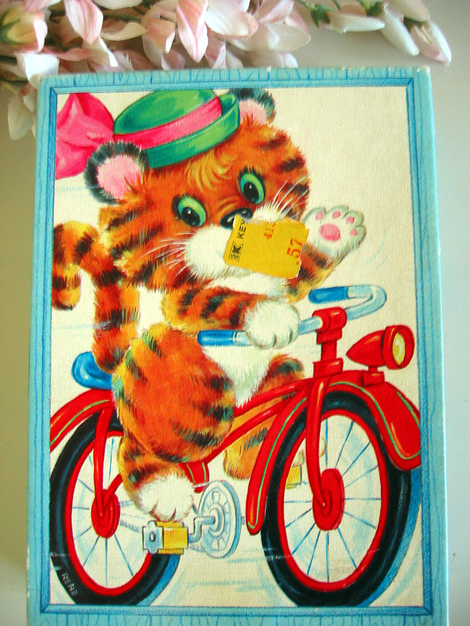 The side of the tiger box is very cute! 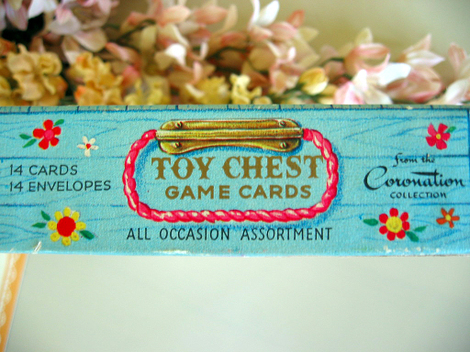 Like a toy chest with a pink rope handle. Centerpieces and A Basket Full Of Fun! I spent this weekend in the company of wonderful and talented fellow romance writers. We held our annual writer's retreat in a lovely, idyllic place that used to be a convent! My task at the retreat is to put centerpieces on the tables in the dining room. I made 14 totes which were stuffed with books and other goodies supplied by my fellow writers. In addition to the totes, my dear friend Debbie Buchanan, generously donated the, oh so appropriate, "Dear Friends" boxes designed by Nicol Sayre. 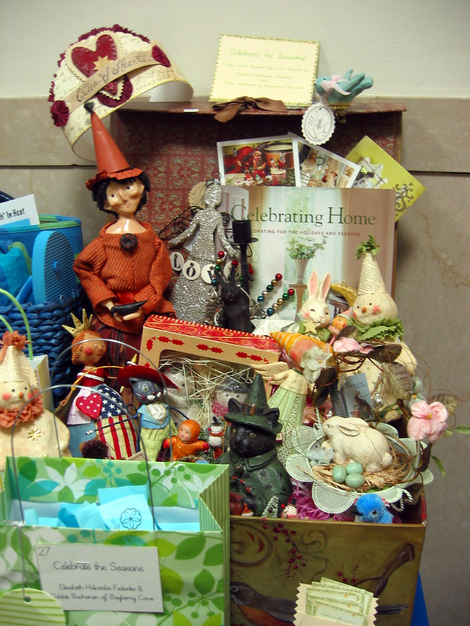 In addition to the centerpieces, I contributed a pretty and BIG box full of wonderful donations and things purchased from Bayberry Cove. 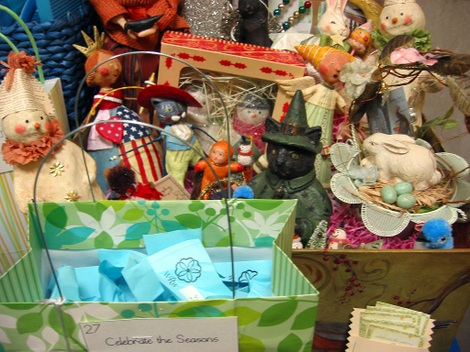 "Celebrate the Seasons" was one of over 50 themed baskets donated by the authors for a wonderful raffle. All proceeds go to literacy causes and women's shelters. "Celebrate The Seasons" got a generous amount of tickets! 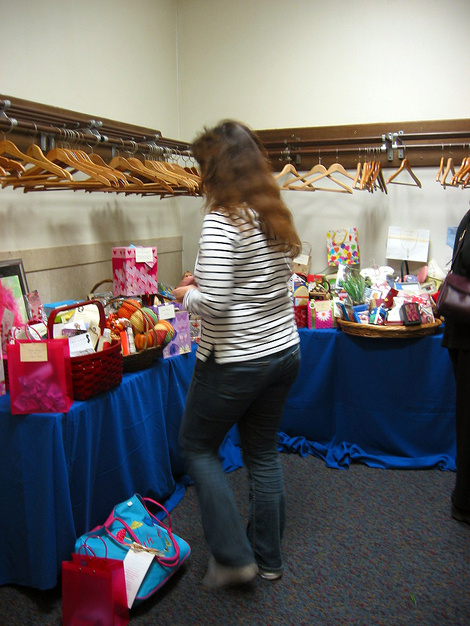 Here is friend and award-winning author Donna Kauffman trying to decide which basket she wants. This is just a quarter of the baskets donated! Is this kitty trying to be scary or sweet? I love his little paws in the air! 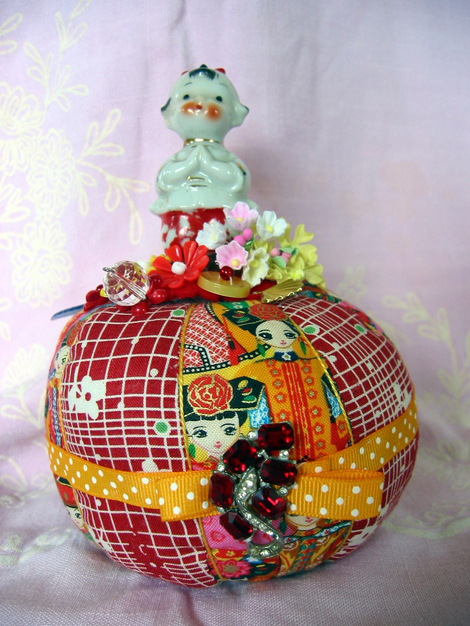 I love this sweet little Japanese girl figurine! I think the fancy vintage rhinestone earring suits this pin cushion well in color and organic shape. This lovely Occupied Japan lady caught my eye the last time is was in our local antique mall. 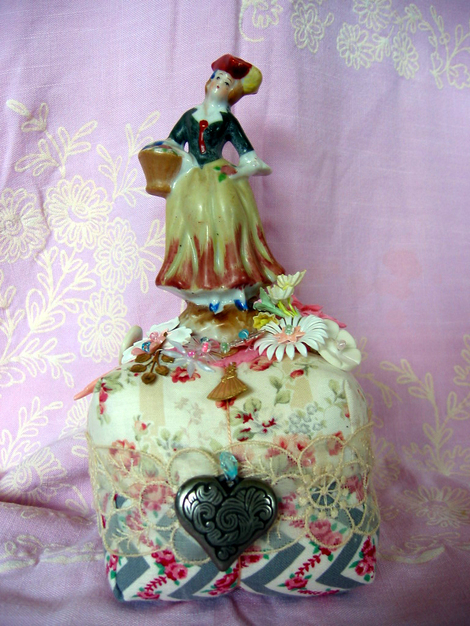 I just had to put her on a cottage rose pin cushion with a lot of love--hence the big pewter-tone heart charm! Ah, Spring! It had arrived in full here in the Washington, DC area. It was sunny 80 degrees today. I took a few minutes to stroll the yard which is getting greener by the day! 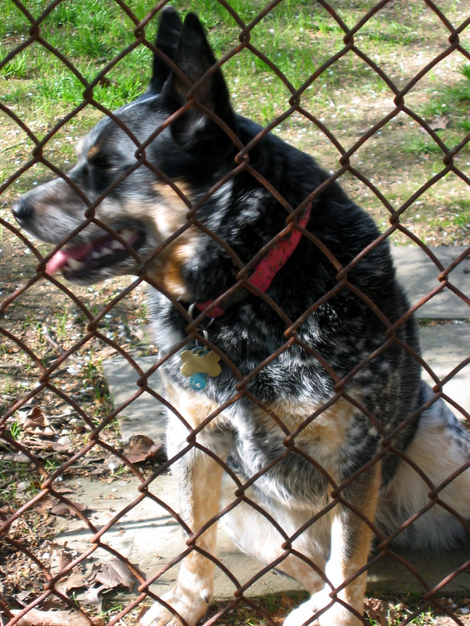 Sheila was not happy to be behind the fence. She refused to pose for this picture! So I came in the back yard with her, and she ran around too happy to sit still for a better picture. 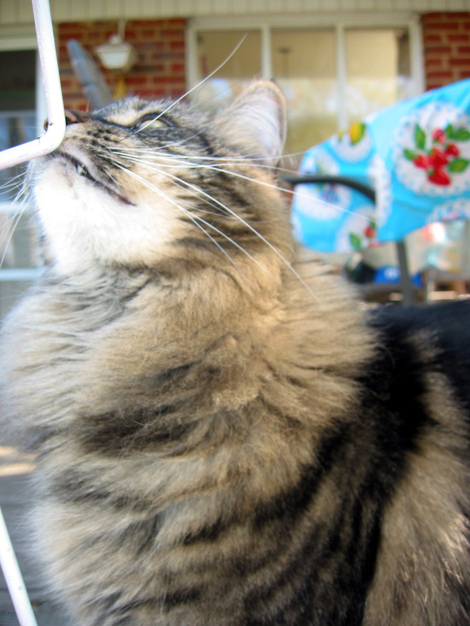 Big kitty, Gyro, kept to the deck and blissfully rubbed the furniture. 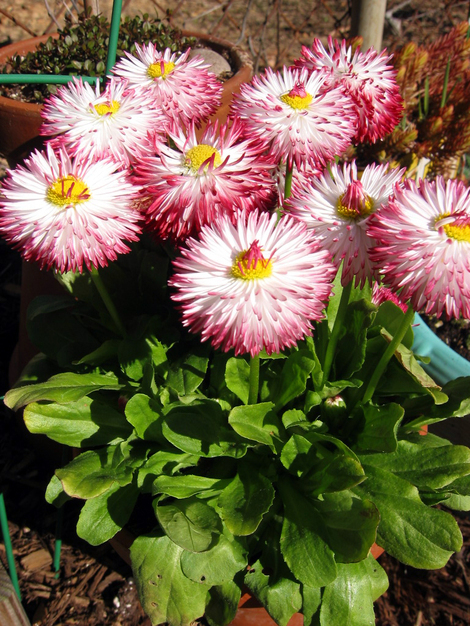 I just adore the wonderful texture of these English daisies I picked up the local garden center! 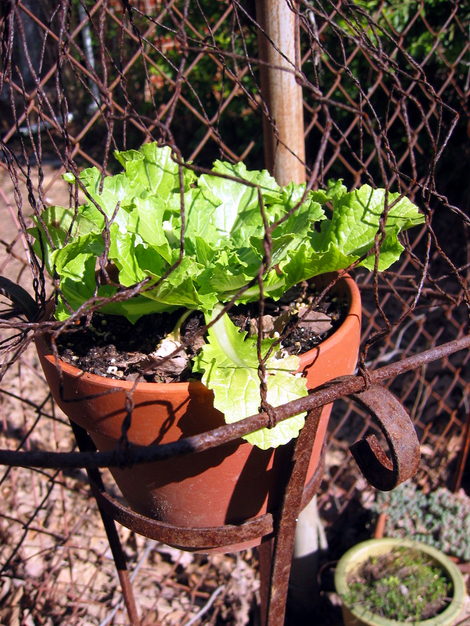 To keep the bunnies from chewing on the lettuce, I put the plants in their own pots and up on these vintage stands I got at a flea market years ago. 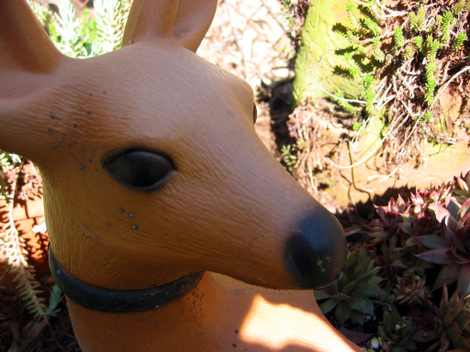 I love this kitschy deer planter. 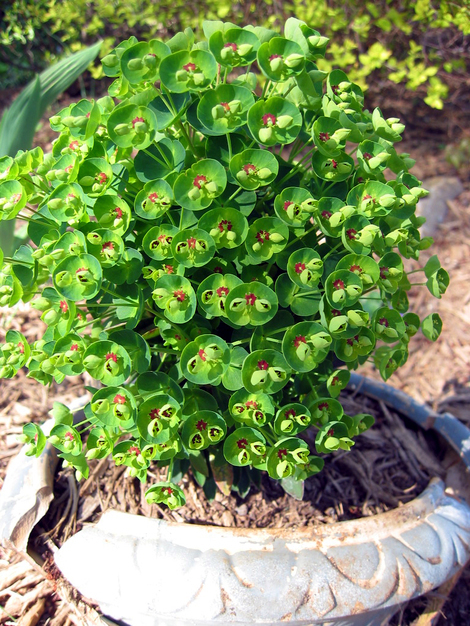 It holds a happy bunch of hens and chicks. The planter is imported...from New Jersey! This herd of flamigos lost thier little stick legs a while ago when Sheila pulled them from the ground and ripped their legs off! 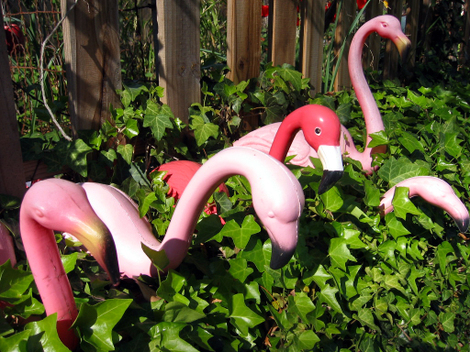 So now they just perch in the ivy trying to imtimidate Sheila when she walks by. 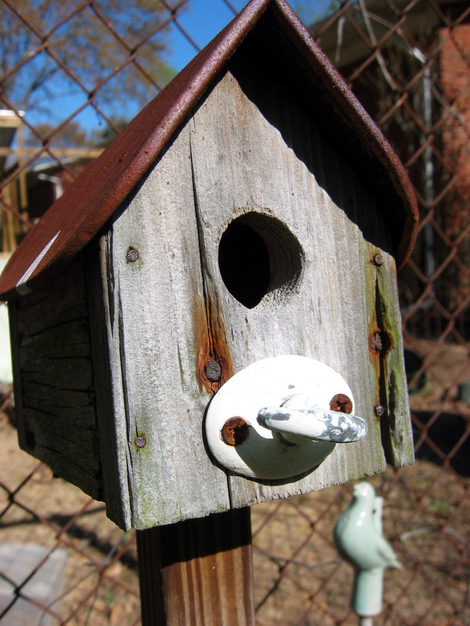 We made this little birdhouse years ago and it is still in pretty good rustic condition. The little bird in the background is from IKEA. 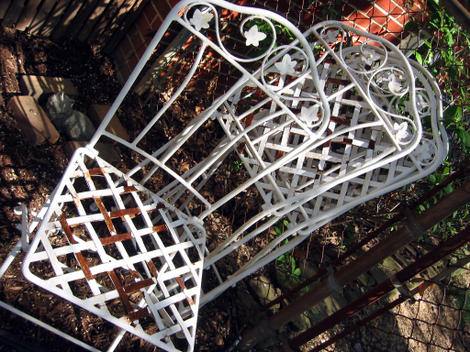 And speaking of rustic...hubby grabbed these metal folding chairs from our neighbor's trash yesterday! Aren't they awesome! He'll powerwash the chunks of rust off and then we'll paint them a pale green! 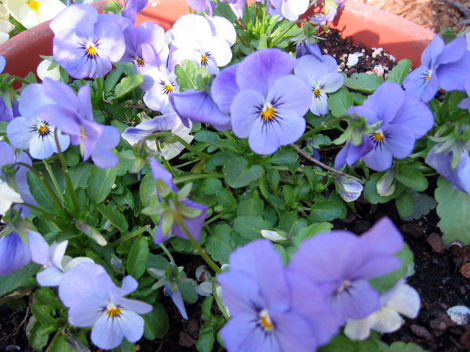 I love these happy little violas! 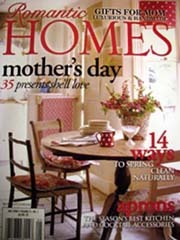 One of My Creations in ROMANTIC HOMES Magazine! 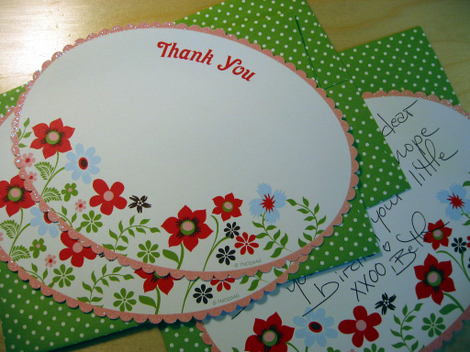 Today one of my lovely customers, the fabulous Kim, sent me a message through my etsy shop. 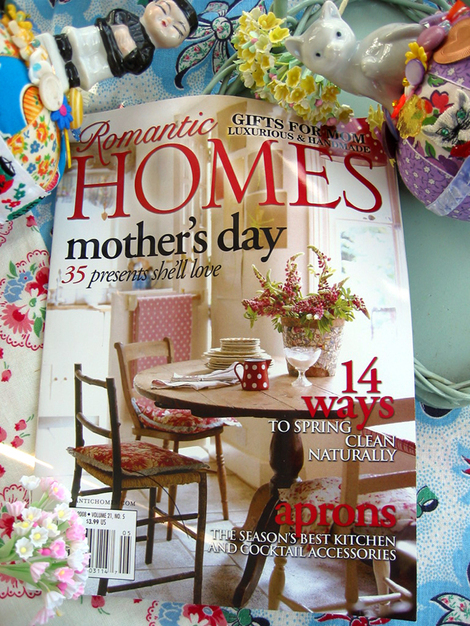 She saw a pin cushion in the latest issue of Romantic Homes magazine. She asked if it was one of mine because it certainly looked like it. Well, I just had to see that magazine, but it wasn't yet at my local grocers and I had a small amount of time to find a copy before I had to pick my son up from his after school activity. So, I did the next best thing and flew over to Debbie's house. 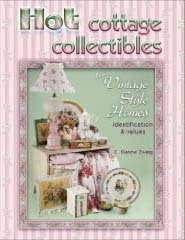 She lives minutes from me and I KNEW she would have a copy as she sells Romantic Homes through her fabulous and famous online shop Bayberry Cove. I also work part-time for Debbie and it is a highlight of my week! Thankfully she had the May issue in stock and I grabbed a copy! I thumbed through the magazine, searching and searching to see if Kim had actually seen one of my pin cushions in there. 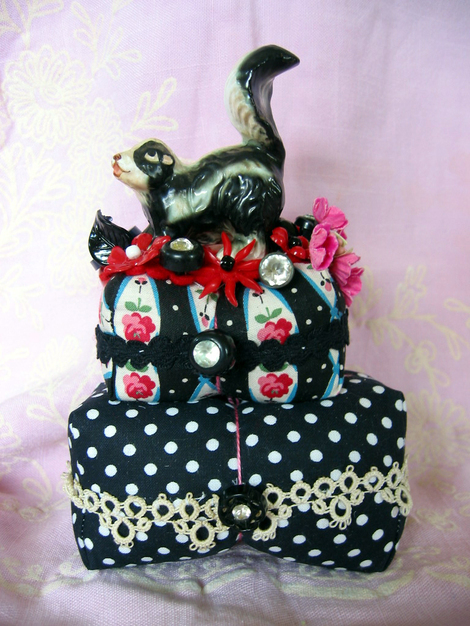 And then there on page 59 in a very cute article full of eye-candy was a pin cushion I had made in what seemed ages ago. 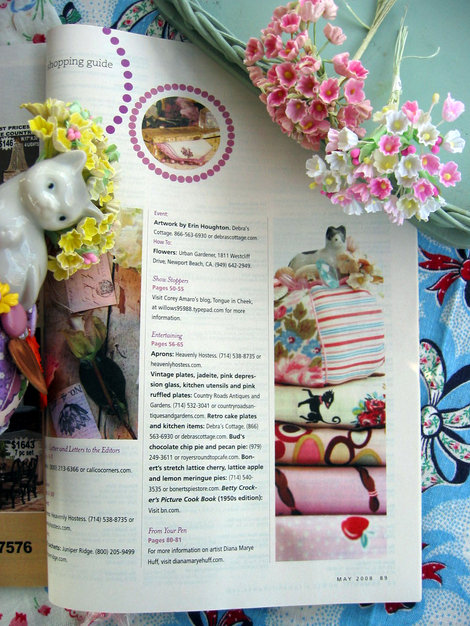 Perched on top of a stack of lovely fabrics in a wonderful photo by Jaimee Itagaki, and styled by Jacqueline deMontravel (Senior Editor of Romantic Homes magazine), was a little bisque dog pin cushion which I had made and sold quite a while ago. 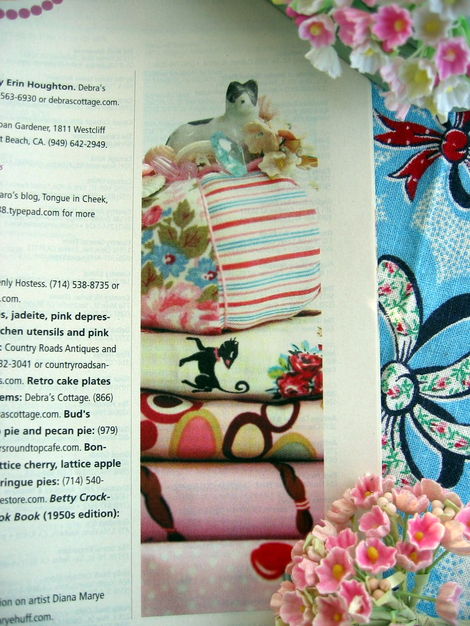 And there it was again near the back of the magazine on the shopping guide page! What a thrill! Alas, the pin cushion wasn't credited as one of mine, but that's most likely because who ever had it and was using it as a prop in this pretty scene didn't remember where she got it either! 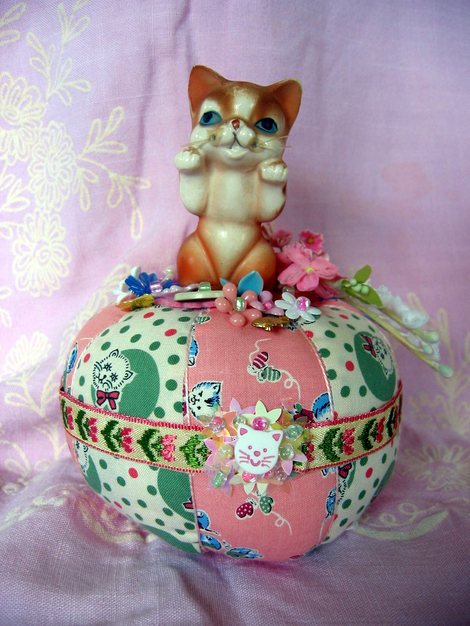 I have sold over 500 of these pin cushions and couldn't for the life of me remember who I had sold this cutie to. Doesn't matter! 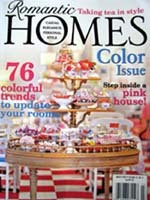 I am flattered to bits that it was chosen as a whimsical prop to be used in my favorite magazine! Packing and Shipping the GOODS! I love packing my wares. 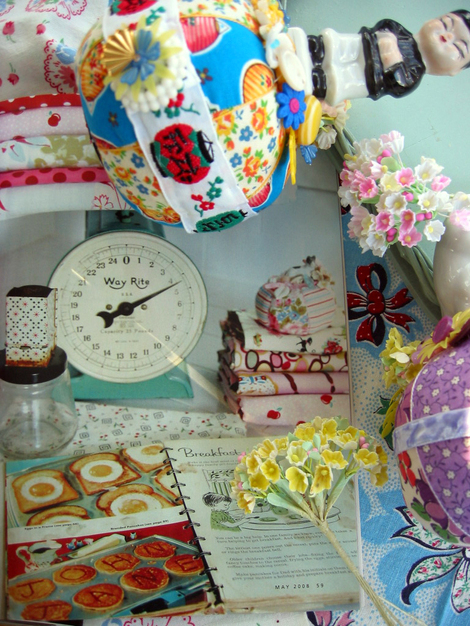 Today I sent out four pin cushions and it takes me a while to pack them as I pay careful attention to the details. 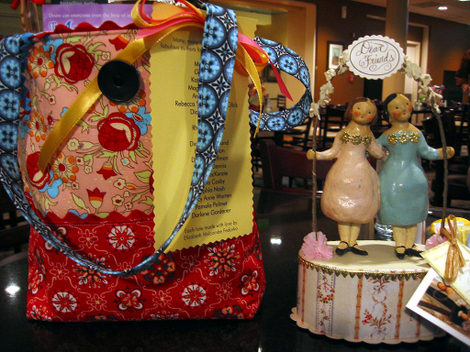 I like to pack my creations like a gift, adding bits and pieces here and there, so when the recipient opens the box she has a nice suprise--at least I hope she thinks it's a nice surprise! 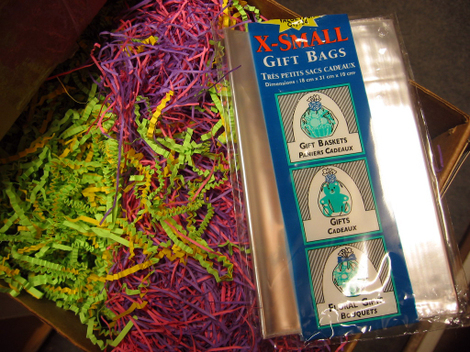 To wrap the pin cushions, I start with a cellophane bag (or cellophane wrap if the pin cushion is large) AND a nice handful of colorful shredded paper. I found a piece of beaded berry stem and a faux flower. 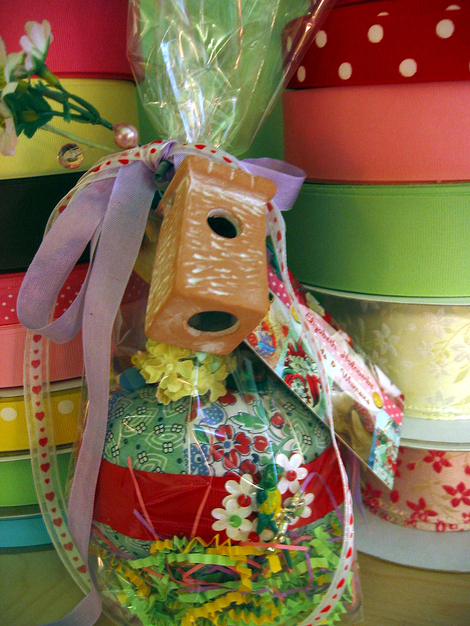 This pin cushion is a bird-themed pin cushion, so I also used a little ceramic bird house as an extra "gift". 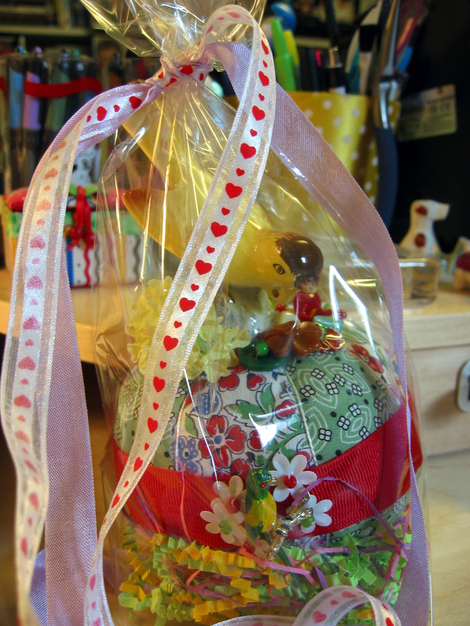 Sometimes I include a small bag of pretty and tasty candy, but no chocolate as it can melt. I also include one of my new nifty business cards on a bit of mini rick rack. 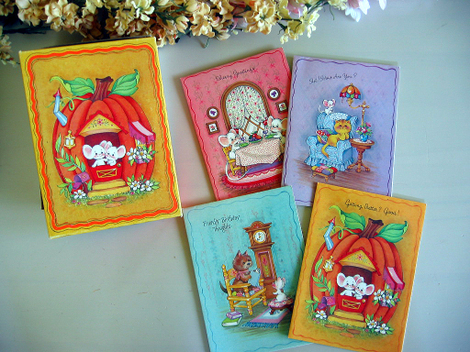 The cards were designed by the fabulous Susan Tuttle. And then the pin cushion and card are inserted gently into a nest of tissue paper into a Priority Mail box, which the post office will GIVE you, in case you didn't know that. 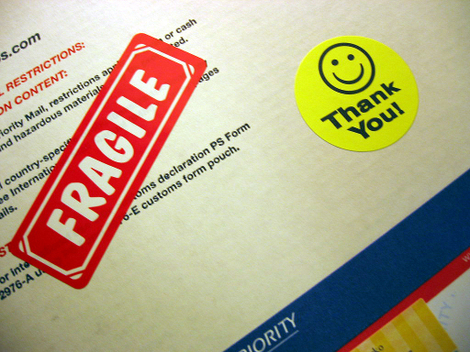 And I found some wonderful "Fragile" stickers on Ebay, AND I decided these smiley "Thank You" stickers were fun too! This has been a very full week. 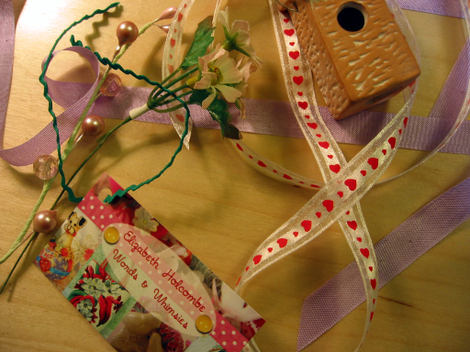 I hope to get back into crafting gear and list some new things for my etsy shop early next week. Until then I thought you might enjoy a few spring photos taken on thursday when we hosted our good friends visiting from Michigan. It was a pleasure to take them to Mt. 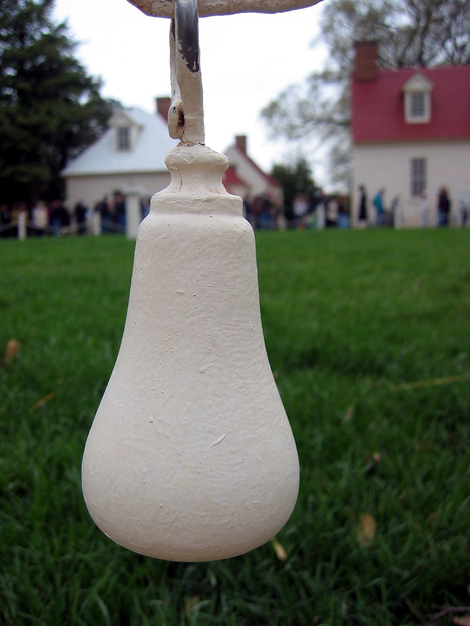 Vernon, the home of George Washington. It's a half-hour from our house. 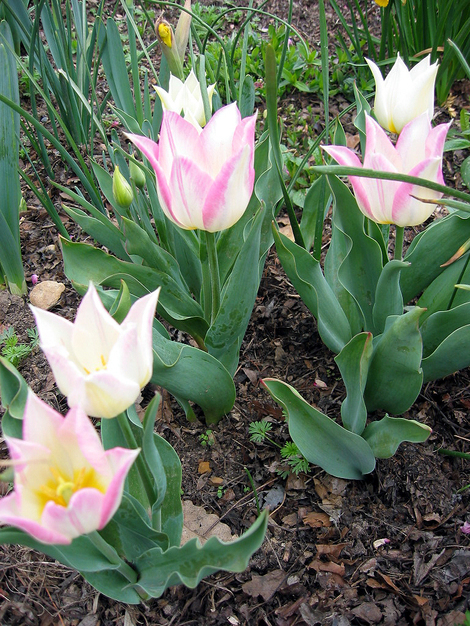 The day might have been cloudy but the spring blooms were in full and lush all over the estate. 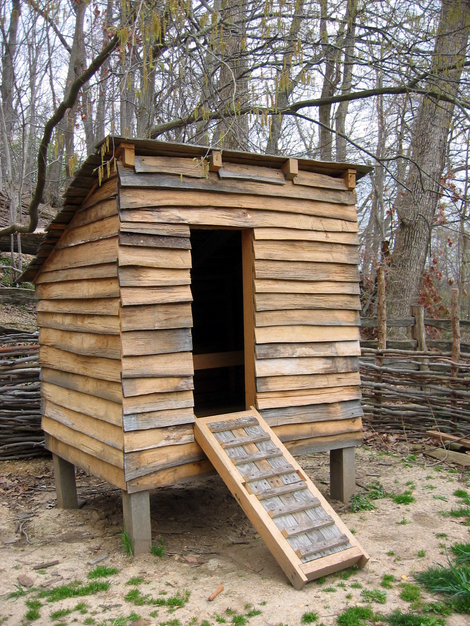 This is the door Washington and guests would enter. The tour guides inside the mansion (where photos are prohibited) called George Washington "The General." I always think of him as President Washington, but General sounds good too. 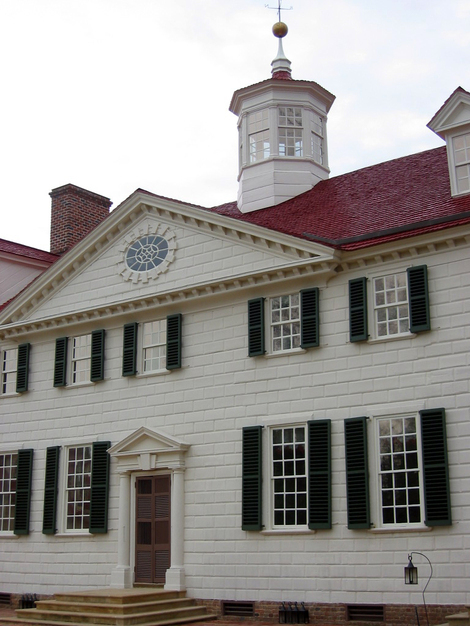 I was born and grew up in Virginia, where Washington was born, and have been to Mt. Vernon many times. I have always been fascinated by the little iron "pears" that dangle in the center of the circular chain fence at the front of the house. I think they are decorative but wonder if they have another purpose. Here are three sides of a 16-sided barn erected on the estate. 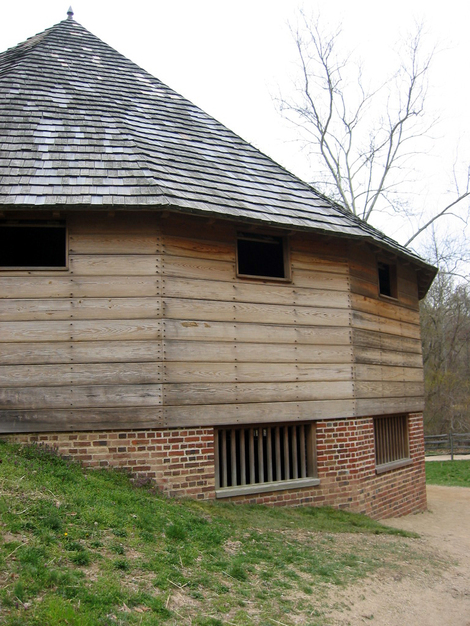 It is a working copy of the threshing barn Washington designed and had built on his farm. I thought this chicken coop surrounded by a wattle fence was cute. What a fun place for chickens to do their chickeny thing! 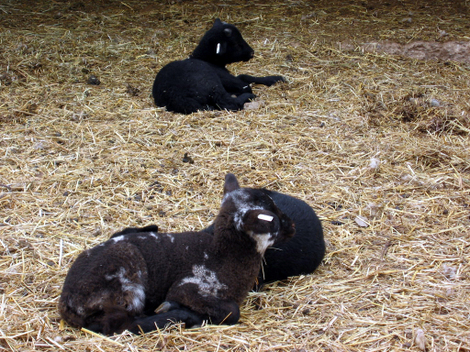 Here are some of the spring lambs born on the estate--too cute! 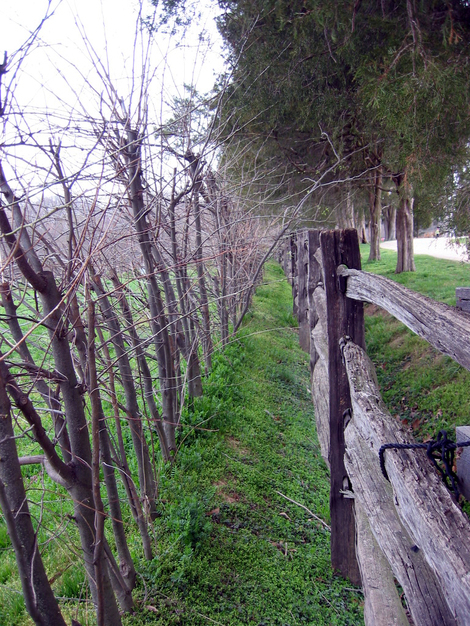 Washington designed a system of natural and man-made fences and ditches around his fruit orchard. He thought the combination of the three would keep deer out of his orchard--wrong! Here are some onion sets in the vegetable garden. 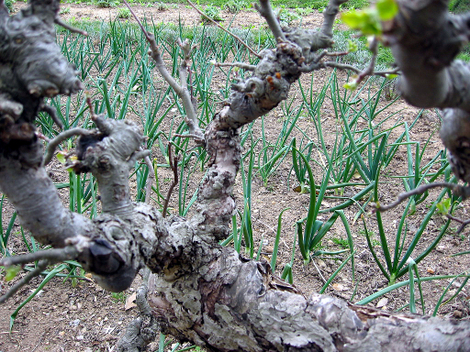 Gnarled grape vines surround the different veggie beds. 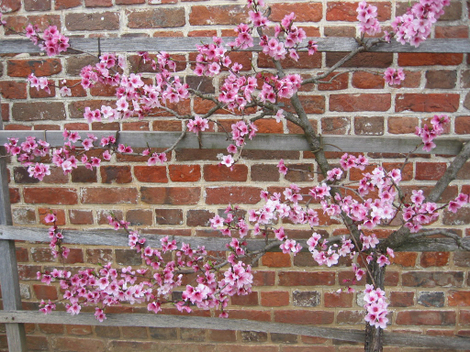 Isn't this cherry tree lovely? 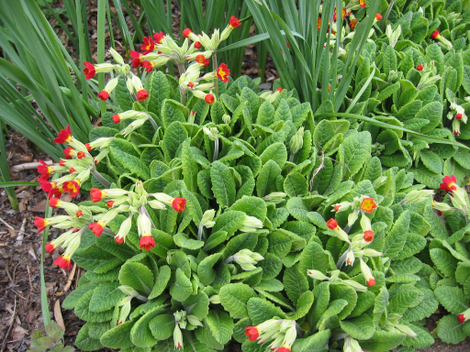 It is one of many ornamentals surrounding the sunken garden on the estate. 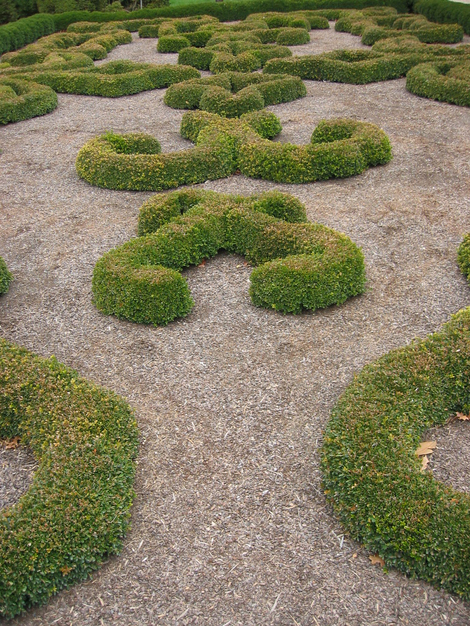 This boxwood knot garden is so wonderful! I had to stand on an iron bench to get this picture. 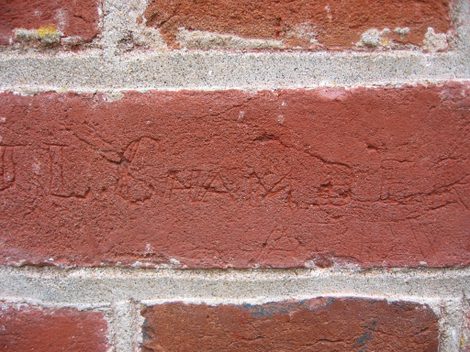 On the bricks of Washington's tomb, are bits of graffiti carved by soldiers from the Civil War. 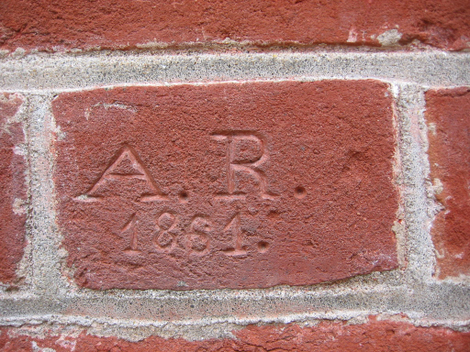 These signatures and initials were revealed after the overgrown ivy was torn away from the brick. I love these flowers. Wish I knew what they are!